Site look funky? Your browser is so old standards compliant layouts and styling confuse it. Consider updating. One excellent option is Mozilla Firefox, versions of which are available for Linux, Mac and Windows. Kristi Schleder paddling Crooked Fork Creek (TN). Welcome to boatingbeta.com. 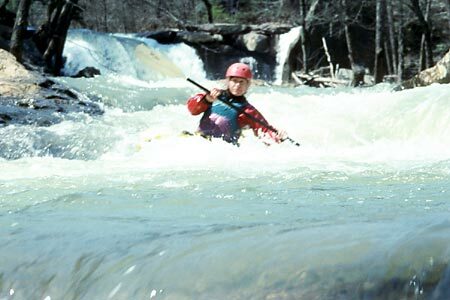 This site provides information (i.e., beta) on the most popular whitewater runs, park-and-play spots, squirt boating destinations and flat water paddled by Asheville, NC canoeists and kayakers. You'll find real time streamflows, rainfall totals and weather forecasts, predicted flows on ungauged runs, information on interpreting flows and rainfall totals, river descriptions, directions from Asheville to the put ins and take outs, a searchable photo archive, camping, eating and entertainment recommendations and much more. This site is -- and always will be -- a work in progress. If you have information to add on any subject related to those listed above, requests to add or information on other runs you would like to see here, or note any needed corrections, please e-mail me. Help support this website! Learn how here: Contributors. If you love our free-flowing rivers, please join American Whitewater. For $35 a year you get a great paddling magazine and you help this non-profit organization defend our streams! Copyright ©2000-19 [Chris Bell (email)].